2. Wash and slice apples into bite size pieces – this is open to interpretation depending on the size of your dog. For mine, I cut them long ways/hotdog style and thin. 3. Drop a few of the apple slices into your paper cups. 4. Then fill up your apple cups about halfway using our water and chicken broth concoction. 1. Place your leftover chicken carcass in a large pot and cover with water. This pupsicle recipe spoke to me for a number of reasons. My dogs love anything chicken, apples, or peanut butter! So a summer treat with 2/3 of their favorite ingredients could not have been more perfect. Additionally, it only takes 6 items and 6 steps to complete these delicious and healthy pup-pops! These pupsicles would be perfect to serve to pups in attendance at a summer barbeque, post-puppy beach day, or a doggy birthday party! We often give these to our pups after a particularly heated day at the dog park or as a post-hike snack. It gives them a chance to cool down, and clam down after the excitement of the day. 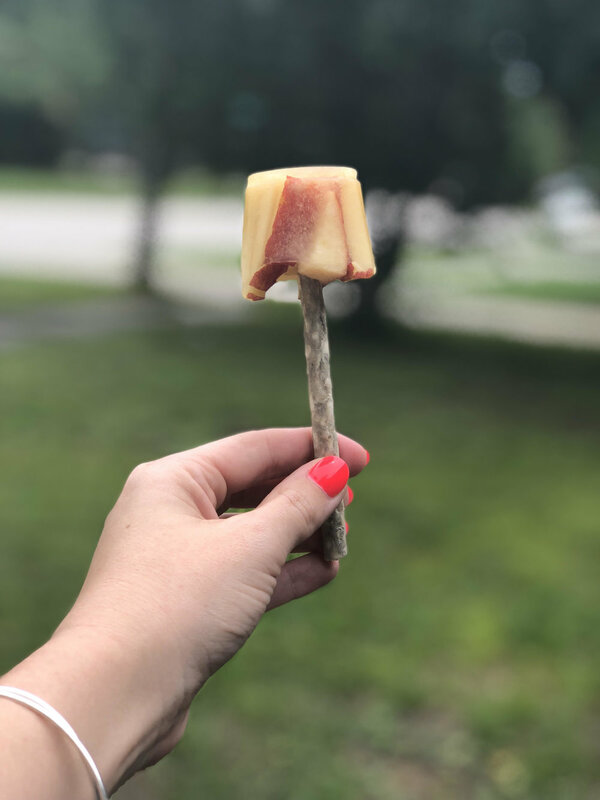 This frozen treat will help keep your pup cool in the summer days to come, provide lasting entertainment, as well as provide them with nutrients and all their favorite flavors! I was sure this would be a summer treat my dogs would love. I hope your pups love it too!